Volunteers from the area are calling the Prestige disaster our Chernobyl. But the damage will not be just to the ecology or the economy. As with Chernobyl, public health is also endangered. Soldiers are allocated to collect oil from near-inaccessible areas, while volunteers continue to clean the beaches, yet again. Despite the precaution of protective clothing, the oil goes everywhere, up sleeves, into boots and gloves, on the face. And for every 1 tonne of fuel oil that the wreck of the Prestige throws out, the workers have to clear up 10 tonnes of a melange of a fuel-oil-and-water emulsion mixed with sand, thus transformed by the agitation of the waves and the addition of beach sand. Nicenot! The fuel oil from the Prestige is dangerous, containing over 50% of aromatic hydrocarbons [n.b. site in French], highly carcinogenic and acutely toxic. Not only will the toxins have effect on those working on the clean-up, but the poisons from the oil will enter the food chain and will remain within it over, maybe, many years. Black tide  Aznar accused. Galician anger at the Spanish government does not lessen. They have contempt for us is the refrain along the Galician coast. Why was the Prestige, leaking oil, pulled up and down the coast for several days, before being left to sink in a place too deep to pump the holds? Why was Madrid so slow to organise help? Why did the government number two, Mariano Rajoy, hasten to say that the oil would solidify at 3,500 metres, only to later admit that the wreck continued to leak? Why did Aznar wait a month before coming to Galicia and admitting (merely) to organisational errors being made? In all the ports, in all the villages, the walls are daubed with Aznar, Rajoy, Fraga, resign . Fraga, a former minister under Franco and now head of the local Galician government for thirteen years, now has few friends or supporters, having gone a-hunting to shoot partridges during the first weekend of the crisis, rather stay in Galicia. Meanwhile, local Galicians have contempt for their politicians: the three weeks delay in sending help, a fishing minister who said that there was no oil slick, an environment minister who orders ministry stickers be put on all the bulldozers and lorries, used to move the oil collected by the volunteers, to show how efficient the ministry is being. According to the Voice of Galicia newspaper , who have access to court documents, the captain of the Prestige suggested mooring his ship close to the coast to enable the holds to be pumped. The Spanish authorities sent the ship into the open sea and there the hole became a lot larger. This was an error, it was necessary to take the ship to a calm area and transfer the cargo, Captain Apostolos Mangouras said. He had offered to the Spanish authorities to stop his ship drifting by anchoring it four miles off-shore, using two anchors with 325 metre-long chains. He had also twice asked for tugs to try and maintain the ship in position until the weather became calmer. Each time, the response of the authorities was negative. The ecologists, the Socialist Party and the Galicians, questioning Madrids decisions since the start, reckon that the government have made the disaster worse. Remember, the government acted on the advice of experts and in order to avoid an economic catastrophe in Galicia. We have to recall, however, that fishing has now been stopped on the Galician coast during the usually lucrative Christmas period. 19.12.02 An excellent summary history of the Prestige spill and the responses of Spanish politicians has appeared in Wired News . This article describes how the apathy and dissembling of the politicians has been disarmed through Internet communication, both by posting information and by enabling coordination of sane responses. The Xunta de Galicia site (the local marine organisation) gives links to associated information on the spill in the Galician region. The pages available include maps of local wind directions (live updates  colourfully pretty), and current predicted slick movements from the wreck and towards the coast. Note: unless you understand Spanish, educated guesses and experiment are needed for site navigation. Having hoped that the problem would just go away, then trying to blame everyone in sight, after being forced finally to attend but then obfuscating by only talking of the clear-up, the Spanish Prime Minister has been forced to comment on his governments ridiculous actions in the early days of the threat, a threat which has now become a major disaster as a result of those actions. Development Minister Francisco Alvarez Cascos took the initial decision to have the Prestige towed out to sea after it was holed in a storm off the northwestern Spanish coast last month, releasing a flood of foul-smelling fuel oil. So, it wasnt Aznar, it was Cascos; but, of course, it wasnt Cascos either, it was shadowy civil servants. Experts, like the captain of the tanker and the worlds top salvage experts, had been ignored when the government attempted to force the problem off their doorstep. Government sources had tried to belittle Smit Salvages assessment; and maybe the captain is still being held as another potential scapegoat. Further, despite earlier experiences of similar lesser disasters in the locality, there had been little preparation for action to stop the problems. Meanwhile, Spain is angling for a large bonus from the rest of Europe, rather than having to pay vast compensation running into billions, as occured with Exxon. In Galicia, another demonstration, 50,000 strong, took place, this time accusing their political leaders of irresponsibility and inefficiency which led to the terrible consequences on the Galician shores. The demonstrators called for both Jose Maria Aznar and the Galician regional president, Manuel Fraga, to resign. Aznar continually refers to lack of resources available to clear up, while attempting to fudge the egregious errors made early on. Without the disgraceful behaviour and errors in the early stages of the disaster, the need for clear up would almost certainly be a very great deal less. I knew very early on, from simple research, that the oil was unlikely to stay in the wreck. The Spanish state and the EU should most certainly have had far better advice than mine on which to forecast that the oil was extremely unlikely to solidify. Are they still attempting to use the captain as a scapegoat? It was the captain who resisted following the irresponsible orders of the Spanish government. The Spanish government also acted against the advice of the salvage company. I do note they have now stopped attempting to blame everyone else in sight. 14.12.02 At last, the Spanish Prime Minister, Jose Maria Aznar, has visited the Galicia area. He apologised to the local people for failing to act effectively or provide adequate resources from the start of the disaster. About a thousand protestors appeared near by, with fights breaking out with the officiers of the peace in riot gear when the demostrators threw eggs at the governmental procession. There were several arrests and some injuries. 13.12.02 One month after the Prestige started having problems, the Spanish Prime Minister is now calling the spill Spains worst ever ecological disaster. About 10,000 Spanish students are joining the many local people cleaning up the extensive mess of poisonous oil lying in large, thick pancakes on Galacian beaches. Sports halls have become enormous dormitories for the students. Three weeks after the spill, the Spanish government has now sent two naval vessels to the Galicia coast and 700 men to help with cleaning the rocks between the beaches. A further 500 men have been sent to the Spanish Basque coast. The plan now is that 7,000 men replace the volunteers. The full 7,000 men have now been mobilised. The Spanish Prime Minister, Jose Maria Aznar, at last admitted today (11.12.2002) after nearly 4 weeks of flummery, that he and his government have made serious judgements of error regarding the Prestige situation. The Prestige was transporting about 77,000 tonnes of heavy fuel oil. On the 13th November, after the crew of the Prestige had been airlifted off, the Spanish government arrested the ships captain for being obstructive. He had refused to start the engines when the ships difficulties began, in case the forces concerned ruptured the ship. He had also refused to attach tow ropes, for fear that the ship would be torn apart. Both these events feared by the captain later occurred. 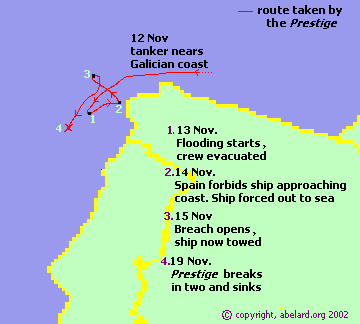 On 15 November 2002, two Dutch salvage tugs, towed the vessel to a holding position some 60 miles clear of the Spanish coast and, following fresh instructions from the Spanish authorities, then started moving the tanker to a distance of at least 120 miles offshore. The Force 9 winds and large seas meant that by the 17th the ship was 65 miles off shore, heading in a southerly direction where the weather was more favourable, the intention being to enter a sheltered location suitable for ship-to-ship transfer of the vessels cargo. However, at 15.00 hours on the 17th, the Spanish authorities requested the convoy to remain at its present location, pending their instructions. So the Spanish government first punish the Prestiges captain for doing his best to prevent a disaster, then order the salvage tugs to take the ship in a direction where it would be exposed to the violent Atlantic conditions. We know the result. Other ships are taking advantage of this spillage to clean their fuel tanks in the wild, thus saving themselves disposal fees. Their hope is that the oil they throw out will not be noticed in amongst the other stuff. Trouble is, their light fuel oil looks obviously different to the dark, thick floating plaques of oil from the Prestige. Would it not have been better to have allowed the tanker to ground (as appeared to be the plan of the Prestiges captain), so that the oil could have been pumped out? Would it not have been better to drag the tanker into a port and then seal off the port? The answer to these questions appears to be yes. Salvage people suggest forcing the ship out was an error of judgement. Exactly why did the Spanish authorities order the tanker dragged out to sea? Was this to remove it out of Spanish waters and thereby avoid responsibility? Certainly, if the salvage tugs had been able to follow the orders that the Spanish authorities gave, the ship would have been taken out of Spanish territorial waters and perilously close to Portuguese waters instead. Rather belatedly, the French and Spanish governments have now placed tight controls on single-hulled tankers more than 15 years old, and ships carrying tar, that wish to pass through their exclusive economic zones, which extend 200 nautical miles from their coasts. Now, by simple agreement, the EU has decided to prohibit all single-hulled ships carrying heavy fuel oil from entering EU ports from 1 January 2003. This prohibition will be gradually extended to other noxious cargoes after its formal ratification in the summer of 2003. EU environmental commissioner Margot Wallstrom, visiting the affected northwestern coastline[of Spain], offered Friday [06.12.02] to send foreign experts to the area. I would like the Spanish government to accept a team of experts to look at the effects both in the mid- and the long-term of the accident, and we also offer to make an environmental study, Wallstrom told reporters after visiting a bird rescue center. What has happened is a criminal act and the guilty ones should assume their responsability [sic. ], those who pollute should have to pay, she said. Meanwhile, the Unites States is providing the example of how oil-tankers should be controlled. Soon no single-hulled ships may enter US waters, while tankers allowed to enter US ports must provide a certificate that any pollution caused will be paid for. Any poorly maintained ships have points deducted, in a similar fashion to the deduction of driving licence points; with a possible eventual result that the ship is banned. Thus, now very few problem vessels now enter US waters.